Several months ago I purchased Gilead Sciences (GILD) in my married put Fusion account. This is an investor war story about this position and some lessons I’ve learned as a result of doing a regular quarterly review of my holdings. But before I get into the lessons learned, I need to share some background information that led up to the purchase in the first place. GILD was ready to move. During the December 2015 to January 2016 time period the entire Biotechnology sector was under pressure and most stocks in the sector declined. But February 2016 brought some stability and consolidation. During the February to March period, volatility declined, Bollinger Bands narrowed, and MACD turned positive. I thought, It was clearly time to consider a purchase in the sector. 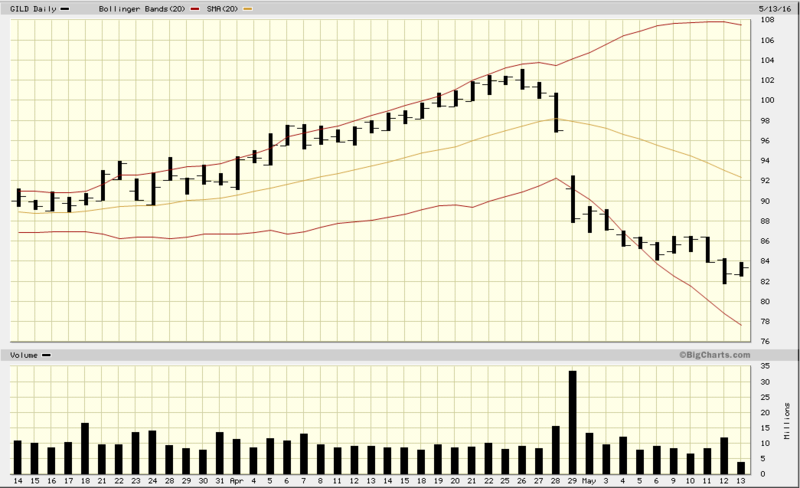 Gilead Sciences was one of the stocks I had my eye on for some time. I was right! GILD breaking out. 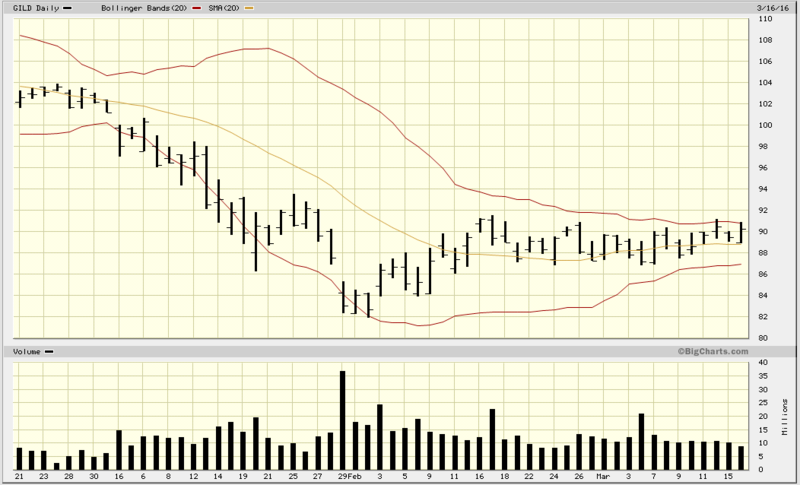 On March 22nd GILD broke through the top Bollinger Band. I often use these band breakouts as a long call or married put buy signal. 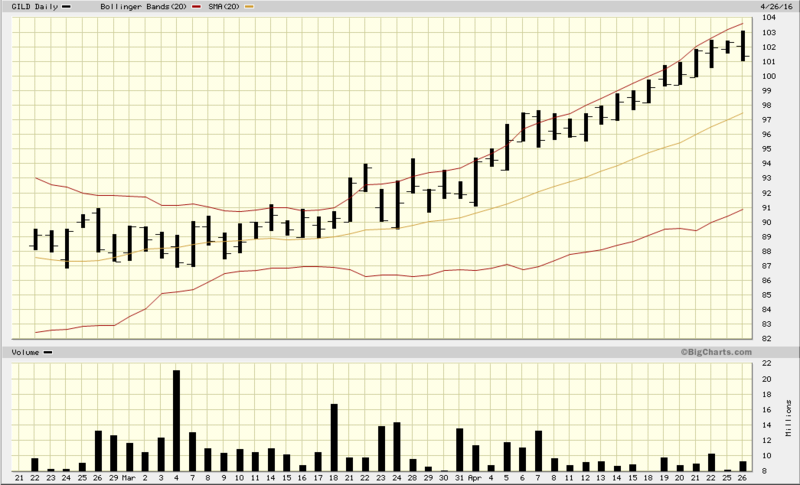 It has been my experience that these breakouts will often carry the stock 10% higher in the next month. I opened a position in GILD the next day at a little over $93 per share with a married put. I decided to use the $95 put strike price which limited the positions maximum loss to about 8%. True to form GILD advanced along the upper band up to the $102 area by April 26th, which was about the targeted 10% I thought I would see. Along the way the “Post Purchase Analysis” tool in PowerOptions suggested I might consider applying Income Method #4 (IM#4) to lock in some of the gains. But, I was over confident and extremely bullish at this point with dollar signs in my eyes. GILD was ramping up with no end in site. “Why not just let it go?” After all I still had the $95 put in place just in case. Oops. Glad I was in a married put position. Two days later earnings came out for the first Quarter and the Gilead plunged 8+ points. And continued to move down for several weeks after. As of this article, GILD is at $82 and change. Don’t second guess your original plan based on over confidence and celebration from being right. When a stock stock rises 5 points over your long put strike price, heavily consider capturing the gains with IM#4, don’t ignore the sound advice. Be especially cautious when holding a position into an earnings event, take some risk off the table. Once the stock fails, exit the trade or buy another put as in IM#12. This is especially appropriate when the stock decline is caused by a company event and not a general market decline. This position has gone from nearly bulletproof to the maximum loss possible of -8%. But thank goodness that the protective put was in place or the position would be even worse! I still have some time left until expiration with the protective put, but I think a recovery is very unlikely. The married put strategy itself and the trading methodology that we teach in The Blueprint is sound and principled, but there is no limit to how human hubris can screw up any good plan. It wasn’t the trading methodology that caused my situation, it was me. It was my trading psychology. I didn’t follow my original trading plan and CEGA model, I got greedy. Remember a similar tail of woe from the investor’s who were taught the “Turtle” trading methodology? Eight of the ten participants strayed from the plan and lost money. While the 2 traders that followed the plan as they were instructed won. What Happens If a Vertical Call or Put Credit Spread Expires In The Money?